You Might be Social Media Trolling if. . . Ever been trolled online? You know, that angry or nasty person that leaves aggressive or inappropriate comments and/or posts on Facebook, Twitter, blogs, etc. They seem to be looking for an argument, a fight or simply to be annoying. Not the automated spam troll, but that real person you may know well, vaguely or not at all. What’s funny is that sometimes the people doing the trolling are completely oblivious that they’re acting like trolls. Below are 11 ways to tell if you've been a social media troll. The Full-Service Troll – You have a Google Alert for certain topics just to find blogs to criticize. The Novelist Troll – When leaving comments on other’s blogs or social posts, you write a 500-plus-word manifesto. The Righteous Troll – You mostly leave Facebook or Google+ comments on posts acting as if you are offended (this is an attempt to disguise trolling). The Peer Pressured Troll – Your friends purposely send you blog links and Twitter comments so you can attack the author. The Luring Troll – You post about politics or religion so others might leave a comment disagreeing. The Poser Troll – You’re the first to point out when you believe someone else’s content is wrong, but create very little or no content yourself. The Skype Troll – You send Skype messages all day, get no response and keep sending them. 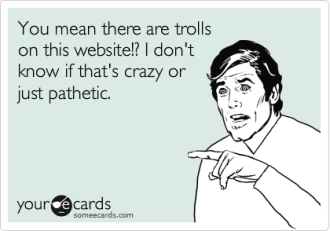 The Jealous Troll – You purposely instigate arguments on Twitter, Facebook or Google+ with industry thought leaders. The Lazy Troll – You ignore content and argue with the author over the title alone. The Webinar Troll – You leave multiple complaints in the text box during a webinar. The Over-the-Top Troll – You communicate your displeasure over an author’s content on every website, blog and social media site a link to the trolled content exists on. Do you know anyone who has displayed the attributes of one or more of the above troll personae? Most don’t exist in permanent troll-mode. It’s up to us to remind them they’re being troll-like when they wander off into troll-land. That’s what social media friends are for, right? If you’ve encountered a social media troll, feel free to leave their persona and a description below. However, if you leave a troll-like comment, don’t be surprised if someone lets you know about it. . .